Students of all majors gathered at Steel Plant Studios the evening of November 13th to admire the artistic talents of their classmates, Carly Stewart and Erin Kerbert. 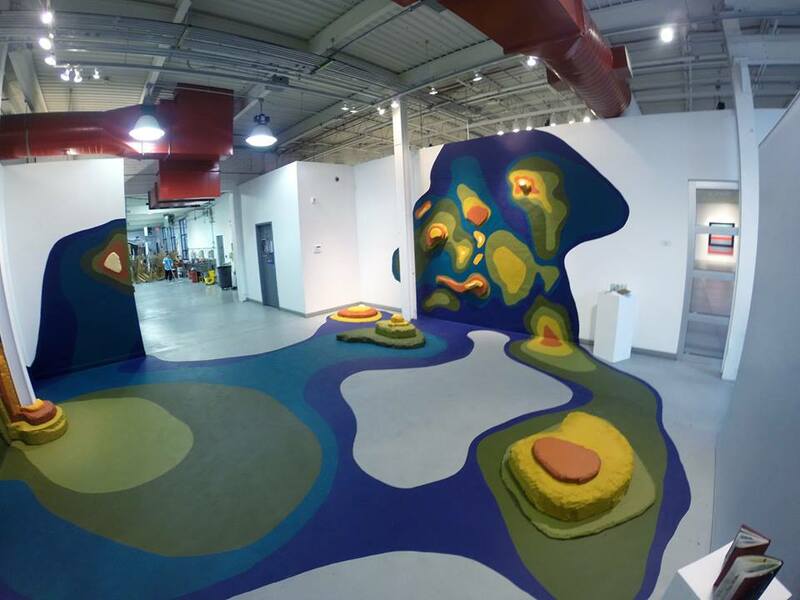 The two senior art majors transformed the lobby of Steel Plant Studios, home to Marist’s Department of Art and Art History, into an enlarged 3D version of a topographical map. Carly Stewart and Erin Kerbert posing with their masterpiece. As a requirement of Ed Smith’s Advanced Studio Seminar class, two students have been putting up a show in the studio each week. While many students have chosen to work solo, Carly and Erin decided to put on a collaborative show that creatively utilized the space. 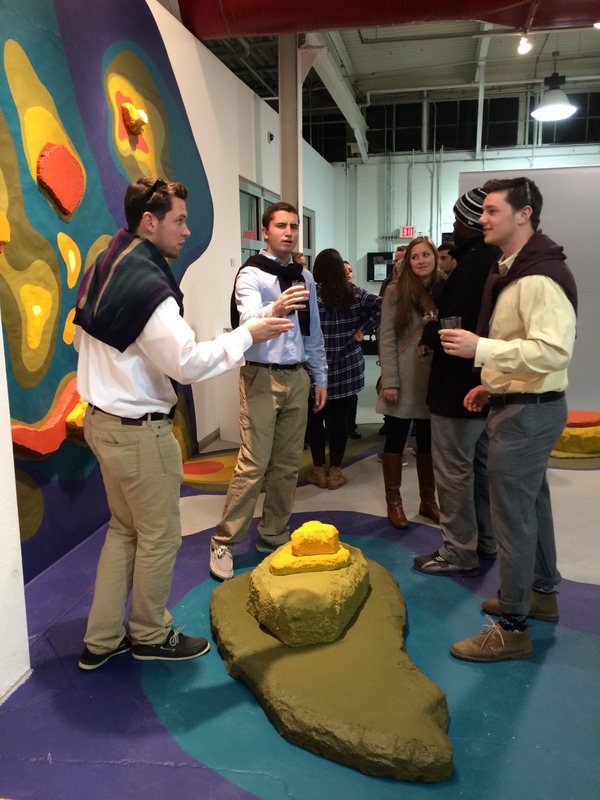 Those who entered Steel Plant Studios on Thursday night walked through a life-size topographical map. Painted in Earth tones, along the floor and walls of the lobby were 2D and 3D shapes that were inspired by those found on a map. 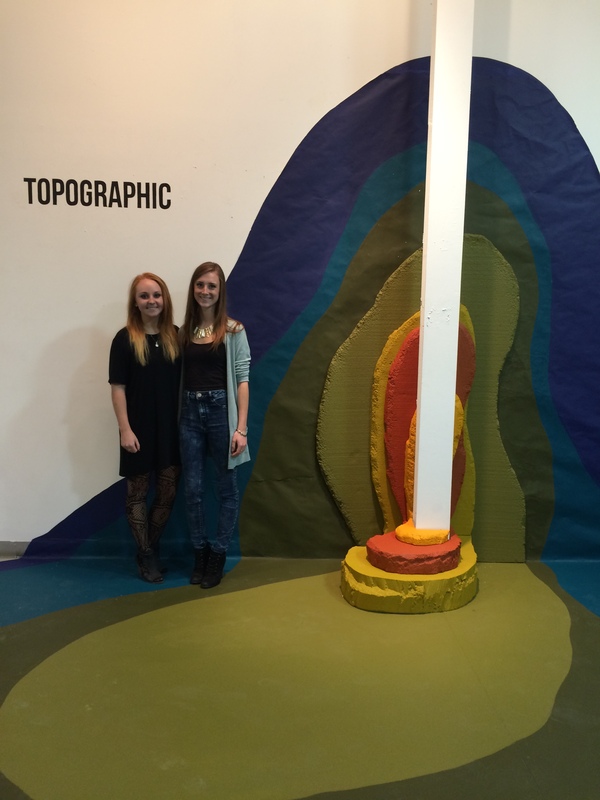 With other students’ exhibitions up each week, Carly and Erin had to strategically plan out their idea months before they were allowed to take over the space. The two were only given a few days before their opening ceremony to transform the image from their heads to in front of their eyes. “It was a lot of trial and error but no fingers were lost in the process,” Carly joked. While both Carly and Erin were very happy with the final result, it did not come together overnight. It was nearly a two-month process from the early planning stages to the final creation. After discussing their idea and sharing their visions, the two got to work. They started with two large pieces of paper from a photo store and began painting on them to create a base for when they would paint on the walls and floor. The next step was getting a bunch of different sized pieces of insulation that would be used to create the 3D effect. Before attempting to form the insulation into the desired shapes, they cut out shapes of paper to use as an outline. Their first attempt at cutting the insulation was with a “hot wire.” They soon discovered that this was too slow of a process and it wasn’t producing the effect they were looking for. Instead, they used a steak knife that they heated with a heat gun to cut through the insulation. When they had the shape they wanted, they melted the edges with the heat gun and painted. Once put in place, the shapes were glued together with a caulking gun and the map began to form. “This is arguably one of the best student exhibitions ever in the student gallery,” said Ed Smith, Professor of Art and Art Gallery Director. An artist himself, Smith has work represented in public and private collections in the United States and abroad. His work has been written about and reviewed in the New York Times, Sculpture magazine, The Baltimore Evening Sun, Art News, The Miami Herald, Times Union, Giornale Dell’Arte, San Francisco Examiner, Art New England and many others. As the fifth show of this semester, Carly and Erin were very pleased to hear of Smith’s positive critique. The opening ceremony began at 5pm on Thursday and ended at 7pm. During those two hours the Steel Plant received a lot of traffic from intrigued students. The exhibition remained in place over the weekend and will be taken down Monday night so the next student artists can take over. While the exhibition was a huge success, Carly experienced a minor setback a few minutes before her show as a student accidentally rode her scooter into Carly’s car. Security guards, policemen and an ambulance flooded the scene and took control of the situation. A window was smashed and a door was dented, but the student was ok and the show went on. “It was a memorable night,” said Carly. ← Marist Singers Hold Annual Benefit Concert for Broadway Cares.